After the West African regional bloc ECOWAS heads of States summit conveyed in Nigerian capital Abuja and subsequent statement on the political crisis in The Gambia, the President-Elect Adama Barrow has issued a statement calling on the outgoing President Yahya Jammeh to peacefully hands over power in the interest of national reconciliation. 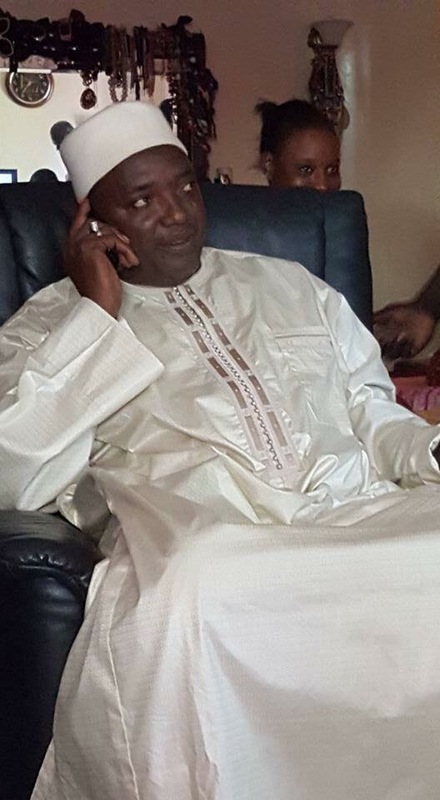 President-Elect Barrow also used the opportunity to remind the nation of the legitimacy of his presidency, which is endorsed both nationally and internationally. He also thank all those who exercised their civic duty to endorse him as the next president of the republic. Below is the full press statement read by Hon. Halifa Sallah on behalf of President-elect Barrow on Sunday during a press conference. “A Government is recognized by states and peoples in Africa today because of Constitutional legitimacy. The Constitution of the Gambia states that the Authority to govern in the Gambia must be derived from the votes cast by the Gambian people. On the 1st December 2016 the Sovereign Gambian people had their say. On 2nd December 2016 the IEC gave its verdict. All the contestants agreed that I am the chosen President of the Republic of the Gambia. The decision of the incumbent to change his earlier decision to accept the results and ensure smooth and peaceful hand over of Executive power came by surprise. His Decision to reject the results has given rise to national and international reaction against his change of heart. My position as President Elect and that of Coalition 2016 is clear. Section 63 Subsection 2 of the Constitution orders that I assume Office on the day the term of Office of Outgoing President Jammeh expires. He assumed office on 19th January 2012. His term expires in January 2017, after serving Five years, as provided by the Constitution. We therefore hold that outgoing President Jammeh is the lawful President of The Gambia until his term expires in January 2017. On the day his term expires my term, as the lawful President of The Gambia, begins. This is the law of the land. My status as Incoming President has unquestionable Constitutional legitimacy. I am therefore preparing to assume office after Outgoing President Jammeh’s term expires in January and the team for the inauguration is at work. This is what I told the Gambian people in particular and the International Community at large. Today, I wish to take this opportunity to inform the Nation that the Constitutional legitimacy of my status as an Incoming President has been endorsed at home and abroad. At home, Civil Society groups in large numbers are endorsing the results of the Elections and are calling on the incumbent not to obstruct the smooth transfer of Executive power. They are the Gambia Bar Association, Medical and Dental Association of The Gambia (MDAG), Gambia Labour Congress, Institute for Human Rights and Development in Africa (IHRDA), Initiative for the Promotion of Democracy and Good-Governance (IPDG), Gambia National Trade Union Congress, Gambia Press Union, University of The Gambia Faculty And Staff Association (UTGFSA), Gambia Chamber of Commerce and Industry (GCCI), National Youth Council, National Youth Parliament, Gambia Association of Public Health Officers (GAPHO), Civil Society Coalition (CSO) on Elections – The Gambia, The Association of Non-Governmental Organisations (TANGO), Female Lawyers Association Gambia (FLAG), Musicians’ Union of the Gambia, Gambia Association of Music Producers And Promoters, African Centre for Democracy and Human Rights Studies (ADHRS), National Association of Gambia Nurses and Midwives (NAGNM) and Think Young Women. The list continues to grow by the day to confirm the resolution of Gambians in ensuring that the Democratic process and outcome are not derailed by undemocratic means. These initiatives have confirmed the internal legitimacy of my Incoming Presidency. Those who do their national duty do not want to be thanked but I must commend them for defending the Constitution and the Sovereignty of the people. Externally, the ECOWAS Heads of State deployed a High-level Mission of Heads of State to The Gambia on 13th December 2016 to review the political situation with all stakeholders. The delegation comprised Her Excellency Ellen Johnson-Sirleaf, President of Liberia and Chairperson of the Authority, H.E. Muhammadu Buhari, President of Nigeria, H.E. Ernest Bai Koroma, President of Sierra Leone, and H.E. John Dramani Mahama, President of Ghana. They are now calling on Outgoing President Yahya Jammeh to accept the results of the polls and refrain from any action likely to compromise the transition and peaceful transfer of power to me as President-elect. They are also calling for my safety and protection to be guaranteed as requested by The Coalition. They also concurred with the Coalition‘s position that I should be sworn in on the day the term of office of the Outgoing President expires in conformity with the Gambian Constitution and promised to grace the occasion in their numbers. In pursuance of peace and reconciliation, they selected a duo to mediate. His Excellency Muhammadu Buhari, President and Commander in Chief of the Federal Republic of Nigeria, will serve as the Mediator in the Gambia and His Excellency John Dramani Mahama, President of the Republic of Ghana, shall serve as Co-Chair. They also requested for AU and the UN endorsement of all decisions made and invited their collaboration to implement them. Prior to this landmark initiative by the Heads of State of ECOWAS, I did receive endorsement from the President of the ECOWAS Commission, the Chairperson of the AU Commission, Special Representative of the United Nations Secretary General to West Africa and the Sahel, High Representative of the European Union for Foreign Affairs and Security Policy and Vice-President of the European Commission Federica Mogherini, EU Commissioner for International Cooperation and Development Neven Mimica, President Ellen Johnson Sirleaf, Chair of The ECOWAS Authority of Heads of State and Government, UN Secretary General, Ban Ki Moon, Senegal’s Minister of Foreign Affairs, Mankeur Ndiaye, US State Department, West African Civil Society Forum (WACSOF). The list keeps on increasing to confirm the external legitimacy of my status as President Elect. In the spirit of National reconciliation, I still wish to call on Outgoing President Jammeh to accept his status in good faith and facilitate a smooth transfer of power. The West African regional bloc said on Saturday it would take all necessary actions to uphold the result of a Dec. 1 election in Gambia, where long term President Yahya Jammeh says he will not step down after losing to President-Elect Adama Barrow. The chairperson of the regional bloc ECOWAS, Liberian President Ellen Johnson Sirleaf on Saturday told the community, at its 50th Ordinary Session of Heads of State and Government in Abuja, that measures will be taken to bring the matter to an end. “It’s now important that the authority at this summit considers measures to bring the matter to a successful conclusion before January 19 … when the mandate of the current President expires,” she told the summit. ECOWAS leaders said in a communique marking the end of a summit in the Nigerian capital that they would attend the Jan. 18 inauguration of Barrow, “who must be sworn in”, and guarantee the safety of the president-elect. Barrow’s surprise victory and Jammeh’s initial decision to step down was seen across Africa as a moment of hope for the continent. However, Jammeh announced on Dec. 9 that he would reverse that position and called for a fresh vote. That move was widely condemned, including by ECOWAS leaders who say it violates the principle of democratic accountability. Jammeh’s APRC party is now challenging the election results in Gambia’s Supreme Court. The Supreme Court has not sat in more than a year, so judges will have to be appointed before they can consider the president’s legal complaint. The measures are expected to be agreed on by the end of the three-day summit on Monday. ECOWAS agreed to “respect the will of the Gambian people” and said the group had nominated Nigerian President Muhammadu Buhari to mediate. “The authority (ECOWAS) shall undertake all necessary actions to enforce the result of the election,” the group added, calling on all stakeholders inside and outside the country to show restraint. “(ECOWAS) calls on the Gambian defence and security to perform their role in a nationalistic manner and protect lives and property,” the final communique said. A Gambian delegation led by Works Minister Bala Garba Jahumpa had arrived while the summit was already in progress to affirm Jammeh’s stance, diplomats said. President Sirleaf and three other presidents in the region including Muhammadu Buhari of Nigeria, Dr. Ernest Bai Koroma of Sierra Leone and John Dramani Mahama of Ghana visited President Yahya Jammeh on December 13 to convince him to step down. They however failed. The United States government through their Ambassador to the United Nations Samntha Power told reporters that Gambia had reached a “very dangerous moment” with Jammeh rejecting the 1st December election results he accepted on the 2nd of December. Ms Power was speaking after a close door briefing of the 15-member Security Council on the situation in the Gambia. She said some military officers had sided with Jammeh following his shock reversal. But she added that the Council was unified in its condemnation of the former coup leader’s actions. UN Security Council Strongly condemning the outgoing Gambian President’s rejection of the official election results proclaimed by the country’s Independent Electoral Commission, the United Nations Security Council urged him to carry out a peaceful and orderly transition process. The Council also urged all parties to exercise maximum restraint, refrain from violence and remain calm, and requested that the security of President-elect Barrow and that of all Gambians be fully ensured. Further in the statement, Security Council members also called on the support by the UN Office for West Africa (UNOWAS) and international partners, especially the Economic Community of West African States (ECOWAS), to preserve stability in the west African country and work towards the installation of a democratically elected Government in the country. The Council members also commended the Gambian people for the peaceful and transparent conduct of elections on 1 December and expressed their commitment to continue to closely follow the evolution of the situation in the country. They further called on outgoing President Jammeh to respect the ECOWAS protocol on democracy and good governance and the African Charter on Democracy, Elections and Governance, notably the rejection of unconstitutional changes of Government, and recalled the relevant provisions of Article 23 (4) of the African Union (AU) Charter on Democracy, Elections and Governance.